Jane’s great grandparents were William Jude (a builder who helped with building the Baptist Chapel) and Elizabeth Owen Jude nee Beal. They lived at 43 High Street, known then as “The Old Home”. Elizabeth used to walk from Harston to Barrington to visit her relatives on paths from the Chestnuts meadow by the river and was unconcerned to walk back in the dark, despite her family’s worry. Their daughter Beatrice was a teacher before marrying Claude Chapman (Jane’s grandfather) in 1904. Beatrice and Claude eventually bought “The Old Home” from William Jude and Claude’s son Eliot (Jane’s father) and family later lived in a hut in the garden there. Claude had been gassed in WW1 and it was uncertain initially whether he would survive. He was a baker at Badcock’s bakery in Royston Road then worked alongside the Judes in the building trade. Claude was also thought to have lived in a row of cottages which were then where No 24 Church St is now. Around 1950 Claude and Beatrice found No 43 was too big to look after as it had a big garden and orchards going right back so he sold it to Mrs Swann (28.08.1950), and they moved back to 2 Haslingfield Road called Riverdale Cottage where they had lived before (in 1911 census). Jane’s Chapman great grandparents (Claude’s parents) lived in a cottage on Royston Rd to the right of the old Post Office, now No 7. A postcard photo of Post Office corner shows James Chapman walking along the High St (probably sometime between 1900-1920). 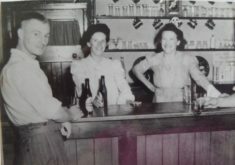 Jane’s mum Rosa met her dad Eliot in the pub when she came to Harston to look after her sister Lily Nicholls, who became ill, while helping her husband George Nicholls to run the Pemberton Arms. Lily and Rose came from Chivnor in North Devon. George had been in the army- not sure why he came to Harston. Rose worked as a waitress at Matthew’s restaurant in Cambridge before her marriage to Eliot. Eliot built “The Green Hut” in the back garden of No 43 High St ready for him and his bride Rosa to live in after they were married in 1934. It was subsequently given the postal address of 45 High Street. 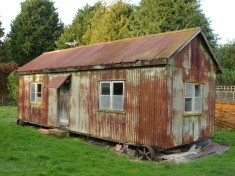 Jane (B:1942) and her older brothers Clive and Roger were all born in The Green Hut. The family called it The Green Hut because of the green paint with which Eliot painted the Hut. The Hut was built without wheels, but with a kitchen on a concrete slab, at right angles to the right. After it was built, some of the villagers complained to the Council about its position. Eliot overcame these objections by putting the main part, the Hut, on wheels. It was never intended that the Hut be moved! After Jane’s father Eliot returned from WWII, he applied for a council house – there were now the parents and three children living in the Hut, although the children frequently slept in their grandparents’ home at No 43. The family were allocated and moved to 15 Church Street in 1947, where Jane’s sister Jill was born (1947). This allocation was conditional on Eliot renting the Hut; Mrs Burnett (a local post lady) took the tenancy. After Jane’s marriage in Jan 1962 to Michael Pevley, they moved to Meldreth; from there she moved in 1963 to one of the line of cottages which then stood at right angles to Church Street where Nos 68/70 now stand. In 1966 she moved to her present home in Queen’s Close so has lived there for over 50 years. Jane remembers a number of her great uncles on the Jude family side and knows they all went to school in Church Street opposite the surgery. William George Jude (1875-1966) was a builder. He bought Hurrell’s Row for £200 at one point. Jane remembers he used to walk over from Haslingfield, where he lived, with his white Alsatian to visit his parents at Riverdale Cottage (2 Haslingfield Rd). In his 90s he was still driving his lorry. He also painted the underneath of the bridge at the Mill, when it was still a mill, by sitting on two ropes he had swung across the bridge. He still smoked 60 cigarettes a day! Her Uncle Arthur also lived at Haslingfield when he was older and she visited him often. He and his wife at one time had moved to Canada in search of a new life there but decided to come back home. Jane’s Uncle Harry lived in Button End when Jane was a child, one bungalow from the end of the right. Ernest Osmond Jude lived at 4 Haslingfield Rd, next to Claude & Beatrice at No 2. Both Harry and Ernest were builders. During WW2 Jane was told that while other children had gas masks she had an incubator they put babies in and the adult had to keep pumping it – not so good for the baby if the adult got hit! When her mother heard the sirens she would run into the house with the three children – not sure why that would be safer. Jane loved to wave to aeroplanes but was told not to during the war! Jane was a baby when her father Eliot went to serve in WW2 and he seemed like a stranger when he returned as she had spent the years with her grandparents at No 43, helping her grandfather with the chickens and smallholding. To the right of the house and driveway they had a large claybat barn (which gradually fell to bits) and kept goats there. They also had a calf which grew attached to Eliot and followed him around, but which they eventually sold to Mr Crow. Next door to Jane’s grandparents lived Emma Louise Bank (where Jenny Embrey now lives) and she kept lots of dogs and Jane’s family saw quite a lot of her. Anyone who had trouble with dogs would send for her as she knew how to deal with them. She also had chickens and orchards like Jane’s grandad. Because Eliot’s occupation was looking after animals on the small holding he could have avoided going to war, but felt he should serve, even though he was 42. He was on firewatch before he went into the army. Because he knew how to keep animals he had some basic medical knowledge so they put him in the Medical Corps where he was quickly promoted to a sergeant. All Jane’s Jude relatives went to the old school in Church Street opposite the surgery. When a child Jane remembers that three Miss Lofts lived there called Fanny, Alice and May. After May had died, Alice got dementia so Fanny was looking after her. To give her a break, Jane’s mum had Alice to stay in their front dining room for a few weeks. Jane and her siblings had to be careful around Alice as she had been a nanny previously and if she thought they weren’t behaving correctly her walking stick came out and they might get hit. Jane started school around 1947 in Miss Jackson’s Infant class, then had Mrs Barnes. The classes didn’t seem too crowded and they had just one teacher for each class. She stayed in Harston school until 15 years old. 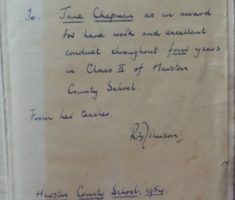 Jane was a hard worker and in 1953 and 1954 received book prizes for this and good progress and behaviour. 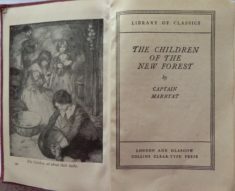 Mr Johnson gave her a book called ‘Children of the New Forest’ which she still enjoys looking at as you can recognise the places mentioned. The classrooms and big hall were at the front of the school in the old Victorian part, with a room to have meals in that were brought in, but cooked elsewhere. Most had school meals. Some children came from Newton and some from Hauxton. There was a small playground to the front of the school on the High St.
Jane had cookery lessons at school and when older had to go to Haslingfield for lessons. She also did needlework and had to go to Mr Shoote’s house for this, where his wife taught her. She also did country dancing. Jane’s grandparents knew the Schoolmaster, Mr Royston, but he left and Mr Shoote came. He taught Jane’s two children, Andrew and Keren, around 1967/8. Headteachers taught as well as doing everything else. Jane worked in school kitchens bit by hall. In the early 1950’s, Jane helped Jack Ship to deliver milk from Baggot Hall Farm with a horse and cart; she remembers delivering to No 6 Green Man Lane (Eli Northrop, village road sweeper) and No 8 Green Man Lane (Mrs How, grandmother of Gerald and John Ives). At this time, Gerald Ives was delivering milk to the northern end of the village. She also remembers that Jack would take the horse for shoeing to the Lawrance smithy in the High Street near the school; Jack would ask her to collect the horse, but when she reached the smithy she would often find that the smithy had “sent” the horse home to the Farm! Jane helped, alongside Brian Williamson and Paul Saunders (her brother-in-law), to run a Youth Club in the Village Hall when her children were that age- in 1980s. Children came from Harlton as well as Harston and some did their homework there. They used to have a jumble sale once a year on a Thursday to raise funds. They also used to have a firework display on Miss Collins’ fields in Limes area and have hot dogs afterwards. There would be a Guy Fawkes competition in the Coach & Horses carpark. Then they walked from there holding torches to where the firework display was. Michael (Jane’s husband) and Brian used to put up the scaffolding for the firework display which ran for several years. In the 1950s a Youth Club in the Village Hall was run by a policeman from Hauxton. 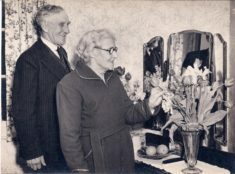 At the opening of the village hall Dr Young gave Beatrice Chapman a brooch for the best dressed person as Eliot had made her a model of the village hall which went on top of her hat. Before the opening they had pantomimes at the Manor to raise money for the hall. 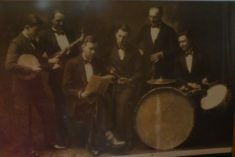 All the men used to gather together in the back room of the Village Hall- before the billiard/ snooker table disappeared! Jane did the Village Hall bookings for 25 years and was on their committee, alongside Charlie Edwards, Peggy Heap and Trevor Yelland. Daphne Mac Mahon was the caretaker. There were several rows of old cottages in Church St- the ones already mentioned to east of Beech Farm where No 24 now is, “Pantiles” (12 Church St) in 1948 was two cottages, as was “Dormer Cottage” (5 Church St) in the 1950’s. Between what is now Nos 12 and 16 was a line of cottages, at right angles to the road. “Fountain Farm”, 41 Church St, was still a working farm in 1947. It had a fenced-in cowpen in front of the barn. Mr Wisbey had geese and his cow and pony were often in the meadow which is now Pightle Close. Jane’s dad Eliot used to get chicken meal from Mr Wisbey there while the children looked for feral kittens in the old barn- now gone – knocked down when a tree fell on it!, He had a horse and cart and sometimes gave a lift to the children when visiting the Baptist Chapel where wife’s gravestone was. Adjacent, Trevor Hopkins’ parents lived in No 39, with his grandparents living in No 37. When the grandparents died, the two cottages were converted into one dwelling. At 1 Church St was Harrison’s Bakery & Grocers. The left hand portion (sloping roof) was the shop; the centre section was the home; the right hand section was the bakery. Jane’s family went there on Good Friday for hot-cross buns. At 2 Station Rd was a driveway to Trigg farm, previously wider than it is now. Some way down it, on the right, were some railway carriages where Margaret, Sylvia, and Ron Thompson were born. When Harston Stores was at 29 High St, Pask the butcher had a shop to the right. This then became Mr Collins’ shop, selling painting and decorating supplies. About 1970, Mr Collins left and that shop became a toy shop, proprietor unknown. To the left of Harston Stores, Miss Jackson had a wooden hairdressing shop, in place about 1966. During WWII, the company PYE used the previous Oddfellows Hall (building to the rear, on the right of 49 High St), the workers accessing the building via an entrance to the right. In the late 1940’s, the right side of the main building of No 49 was a sweet shop; Miss Mumford had her shop there before that. Next door, at 51 High St, Mr Knight had a green grocer’s shop in a “prefab” building some time after 1961; he and his wife lived behind the shop in a caravan. At 59 High St, Mary Law’s husband was a mechanic for Premier Travel; they lived in Castle Cottage, which was in front of the Premier Travel garage at the rear of the plot. Mary later moved to 31 High St (near where Charlie Rogers lived in 33 High St behind shop) – and then moved to 122 High St.
Mrs Baker (connected to Haslingfield Lawnmower Baker) was well known for protesting against nuclear bombs. Jane’s family would see her coming back on the train from a ‘ban the bomb’ protest in London or Aldermaston. Mrs Sellen was a Quaker. She ran music classes, playing the piano and organised young musician concerts. Miss Ada Farrington also gave piano lessons and Jane’s daughter Keren went there in 1970s. Ms Farrington lived in Stag villas. Mr Jacklin lived there before that (he grew vegetables where the surgery now is), and Miss White before him. Miss White gave people beautiful wax dolls. Jack O’Lantern’s Pit was reached by the Public Footpath to Barrington, on the left of the Haslingfield Road just past the road bridge over the River Rhee. It is thought to have been used to dig for sulphur/coprolite, and reported to glow in the dark when its water level was low. Queen’s Close was built in the late 1940’s, with Meadow Way being built much later in the 1970’s.